Patch 2.3.0 brings a huge number of changes to Diablo III. From new features to anentirely new zone, there is plenty to discover for the first time. However, we’re not stopping there. We also have some quality of life and system changes coming to Adventure Mode, designed to make both leveling and maximum level play more smooth and streamlined experiences. Let’s start with the basics: crafting. Crafted items have fallen into a strange place where they feel too expensive to craft and, aside from a few select pieces, often not worth the effort. We’re aiming to fix that in Patch 2.3.0. First off, we’ve removed an entire tier of crafting materials, including Common Debris,Exquisite Essences, Iridescent Tears, Demonic Essences, and Fiery Brimstones. This leaves one remaining tier of crafting materials, making items salvaged at any level always useful. We’ve also trimmed the fat away from the list of crafting recipes for both the Blacksmith and the Jeweler. There is now a much smaller pool of recipes at each artisan level, and while there should still be a good mix of different types of gear to craft, each unlocked level should feel like a meaningful stepping stone that’s worth the crafting materials you spend. Disparities in crafting material abundance have been evened out, both in terms of how often they drop and how often you’ll require them for crafting: no more 72 Arcane Dust bracer recipes! Left: The current recipe. Right: The 2.3.0 recipe. Crafting costs in general have been reduced across the board, especially for gear that’s intended for use while leveling or to help you gear up when first hitting level 70. Crafted Legendaries, for example, no longer require Forgotten Souls to craft (though they also no longer provide Forgotten Souls when salvaged). Instead, they will now require new Act-specific crafting materials that can be obtained at any level by completing bounties. This should make these items feel like a viable option for starting out whether you’re a new player or starting a new Season. In addition to adding a new zone with its own new bounties to tackle, the rewards gained from bounties have been revised. Nephalem Rifts no longer require Rift Fragments to enter, so we needed to change the incentive behind completing bounties. In addition to being the only way to obtain the new Act-specific crafting materials used with Kanai’s Cube, we’ve shifted the reward from bounties to focus on being the primary source for gold and crafting materials. It’s also a great way to complete your crafting recipe collection as each cache guarantees at least two crafting recipe drops if you are missing any. If you want to craft a bunch of stuff, bounties are now the place to go to get started! Bonus bounties are bound to be beneficial. We’ve also changed up the bonus Act mechanic. You’ll find there is now only one bonus Act active in a game at a time. Each player in a game who completes the active bonus Act will receive a Bonus Cache, stuffed to the brim with crafting goodies. Once the bonus Act has been completed, it will automatically rotate to a new Act, eliminating the need to start a new game to receive this benefit. Rather than navigating game menus, we want you to spend more time doing what matters: fighting the good fight and destroying demons. Nephalem and Greater Rifts both have a huge number of changes coming intended to draw a clearer line between the two. Nephalem Rifts are aimed at being a more relaxed version of a loot run while Greater Rifts are where you go to strut your stuff and push the limits of your nephalem heroes. Let’s start with the biggest change that you asked for: the Realm of Trials has been removed from the game. To accommodate this huge change, we’ve reduced the number of Greater Rift keys down to a single, universal type. These new keys are used at the Nephalem Obelisk to enter any level Greater Rift, up to one higher than the highest level you have previously completed (though if you totally crush a Greater Rift, you can still move up to 3 ranks at a time). In addition, we’ve removed Rift Fragments from the game. 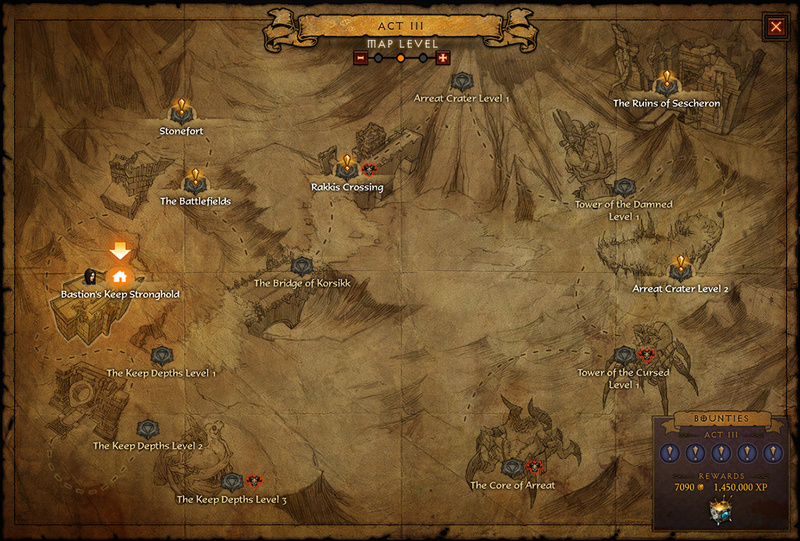 Nephalem Rifts are now open to players of all levels and difficulty, requiring no special key to access. 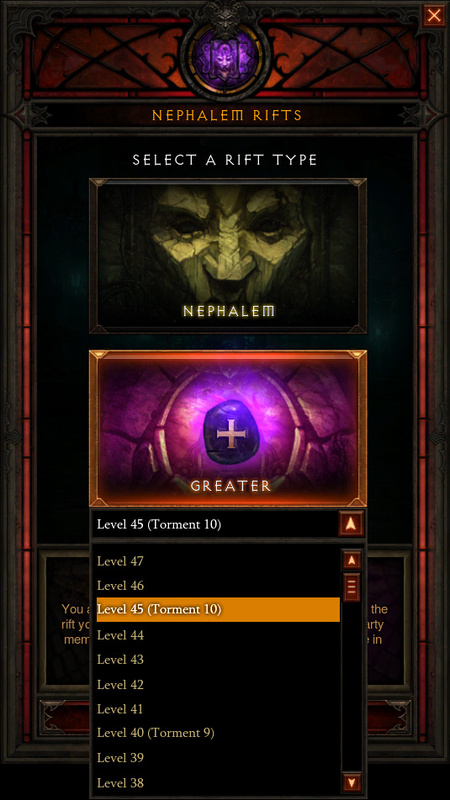 Greater Rift tiers are even labeled with their approximate difficulty equivalent. Greater Rift keys are now able to drop from Rift Guardians at any difficulty level, including Normal through Torment I. This chance scales up to 100% at Torment VI and there is an additional scaling chance for a second key to drop in the new Torment VII-X difficulty levels. Greater Rift keys are now only usable for one level and can no longer be upgraded. Instead, when you successfully complete a Greater Rift, you’ll automatically get the Legendary Gem upgrade screen. Please note you will no longer get the gem upgrade screen if you fail to complete a Greater Rift. Our concern is that players might tackle a Greater Rift well beyond their ability just for a chance at upgrading. This experience would feel sluggish and miserable and isn’t something we want to incentivize. There have been several other balance changes made to Rifts, including tweaks to Rift Guardian mechanics, enemy health, and the progress meter to even out the amount of time you spend clearing regular enemies versus fighting the Guardian. For more information, we recommend checking out the full PTR patch notes or simplygiving the PTR itself a go! Last but certainly not least, the Infernal Machine event is getting a few minor but meaningful tweaks. The largest piece of feedback we’ve heard regarding the Hellfire Amulet and its counterpart Ring is that these items often felt too gated by multiple levels of luck. The time investment was high and, even after dedicating that amount of time, the payoff wasn’t guaranteed. While we still want the Hellfire items to be an investment, we’ve slimmed down the process to make it less time intensive to complete. To start, there is no longer a need to craft Hellfire Machines; the recipes have been removed from the game and each Keywarden now has a chance to drop an appropriate Infernal machine. The chance for an Infernal Machine to drop remains the same, though now appropriately continues to scale into Torment VII-X. We’re cutting out that middle man, Haedrig. His interest rates were terrible anyway. In addition, the Hellfire Amulet is now guaranteed to roll with a socket. This removes a layer of luck to acquiring that perfect complement to your gear and should, overall, make the time invested into crafting one of these items feel well spent. 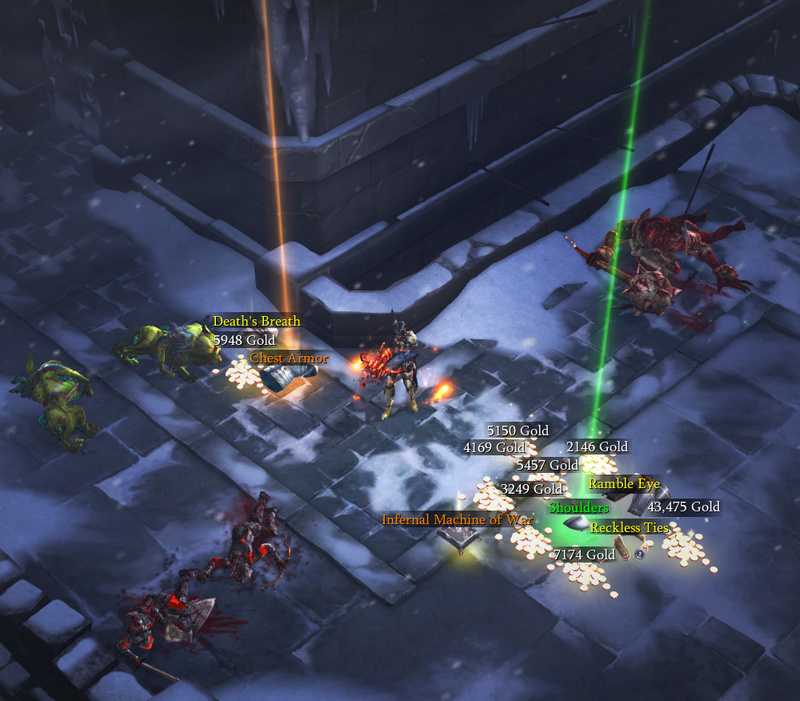 Adventure Mode has been an extremely popular addition to Diablo III. You love spending time there, and we want that experience to continue being fresh, rewarding, and fun. These changes are currently live on PTR for testing, and we’d love to hear your thoughts on them. Which change are you most looking forward to? Have you given any of these changes a try? What did you think? Let us know in the comments and we hope you’re looking forward to Patch 2.3.0 as much as we are!